Inventory Tweaks Mod for Minecraft is now officially released. 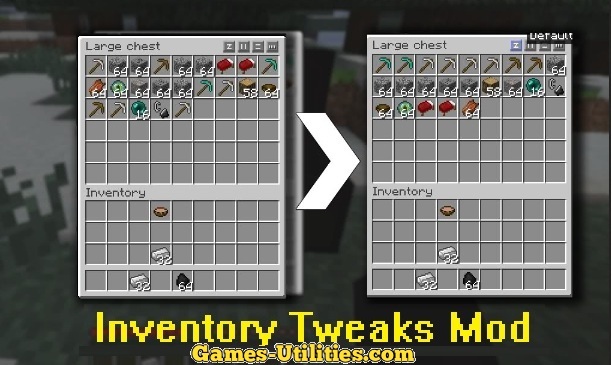 Inventory Tweaks is a inventory management modification which allows you to properly adjust your items, blocks and weapons and save a lot of time. It sorts your item in 4 categories and automatically puts them in their slot when you break them. This mod comes handy when you have a hundreds of items in your backpack. Description: Inventory editing mod for Minecraft. – Inventory tweaks can be installed using ModLoader or Minecraft Forge to install this mod. – Put the mod jar file in your /.minecraft/mods Folder. — Post a comment below, if any crash, problem or blank screen occurs after installing Inventory Tweaks 1.6.2 mod.